Socedo is a social media management platform that helps businesses discover customers on social media. As a steadily growing company, Socedo has rigid weekly and monthly marketing goals. Adam Hutchinson, Marketing Manager at Socedo, had started hosting webinars to educate businesses on the benefits of using Socedo. He was receiving positive feedback about the content and was wondering how he could improve attendance and engagement after the webinar was over. Adam also noticed that many qualified leads weren’t converting off content alone. He needed a solution to give high-value, highly engaged leads a “final push” into signing up for a free trial. 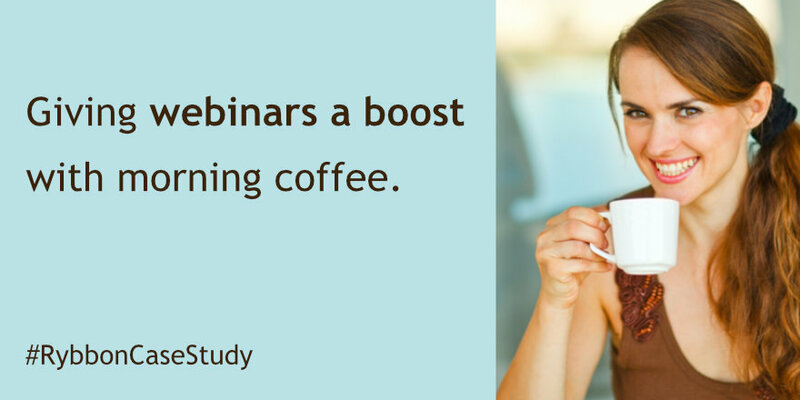 For the next webinar, Adam tried something new to cut through the inboxes – he offered attendees a cup of coffee while they tuned in for the webinar. Adam connected Rybbon to Marketo and GoToWebinar, to automatically send registered users a gourmet coffee gift card. “Sign-ups were through the roof!” Adam found. Previously, if Socedo needed a bump in sign ups, they had to do a lot of manual outreach. Now, Adam can automate a friendly, personal touch that’s meaningful to the customer. Adam loves how easy Rybbon makes it to execute such campaigns. Rybbon automatically builds gift-landing pages with Socedo’s messaging and tracks gift claims. Aside from boosting webinar success rates, Adam also used Rybbon gifting in Socedo’s end-of-month email blast to engaged leads to drive more prospects towards a free trial. Gifting with Rybbon doubled Socedo’s webinar registrations and increased attendance by 30 percent. Better yet, Adam experimented with sending the gift the morning of the webinar before it started, so people could grab their coffee before attending. The end-of-month emails saw double the conversion rate on new sign ups, compared to normal email blasts. “Using Rybbon has a lower cost-per-lead than paid search or sponsored content” said Adam. Adam is excited to use Rybbon to engage recipients with invitations for other event-based campaigns, such as conferences and sponsorships. He also plans to expand who sends gifts, beyond their Marketing team. See for yourself how you can get closer to your leads, no matter what your Marketing strategy, with a demo of Rybbon. We’ll send you a cup of coffee, on us!